I received a very polite query recently about the post I wrote on Starbucks stock back in November. I won’t copy it in full, but the reader basically wondered why I compared Starbucks (NASDAQ: SBUX) to McDonald’s (NYSE: MCD) since the business models and growth outlooks are so different. Let me answer the question by splitting it into two separate ones. First off is the “business” part, where the reader was absolutely right to point out that McDonald’s and Starbucks sell different products, have different competitors and so on. McDonald’s is a fast food chain, has predominantly franchised outlets and has struggled to grow both revenues and earnings in recent years. Starbucks on the other hand sells coffee, manages its own stores with very few franchises and, growth wise, has been on a tear ever since it was founded. Even over just the last five years it has posted nearly 20% average annual growth in earnings per share. I guess in really general terms you could make easy comparisons in terms of underlying quality of profits. For example, they’re both relatively capital light and enjoy freakish returns on equity and capital. In the case of McDonald’s this has allowed them to be insanely generous in terms of showering their shareholders with cash. If you owned stock over the past decade you’ve seen well over $25 a share in cash dividends (compared to a January 2007 share price of around $43.50) and the share count reduced by 30%. For Starbucks it has allowed them to finance their stellar growth without taking on much debt (an underrated point because it can be really tempting to ignore balance sheet strength these days). Now, imagine you line up a couple of dozen regular mum and dad investors who are generally knwlegable about blue chip stocks. Let’s then suppose you ask them to identify a difference between Starbucks and McDonald’s right now. What do you suppose the most common response would be? I’d wager that it would be something to do with growth. Or more specifically that Starbucks’ future growth prospects looked much rosier than for McDonald’s. The reader also made this point in the initial correspondence, and I think it would be hard to argue that they’re not absolutely correct. Obviously we can’t be a 100% certain about these things, but based on the current and past knowns you’d probably plump for Starbucks in the growth department over the next decade or so. Okay, so that’s the difference from a business point of view. Now let’s look at the second part: the stocks. Regular readers will know that playing off value versus growth has been a consistent theme of the site. At the risk of going over it for the 529th time let’s briefly revisit the situation with McDonald’s stock during the dot-com era. You can read the more detailed version in April’s post but basically its not an unreasonable position to compare McDonald’s of yesteryear with Starbucks today. Even back then McDonald’s were throwing off something like 15% of their sales as cold hard profits, and over the five years prior the company had grown the top and bottom lines at a double digit annual clip. In other words it had displayed all the great quality and growth hallmarks that Starbucks stock appears to have right now. The only thing you might really grumble about? Yup, it was the price. 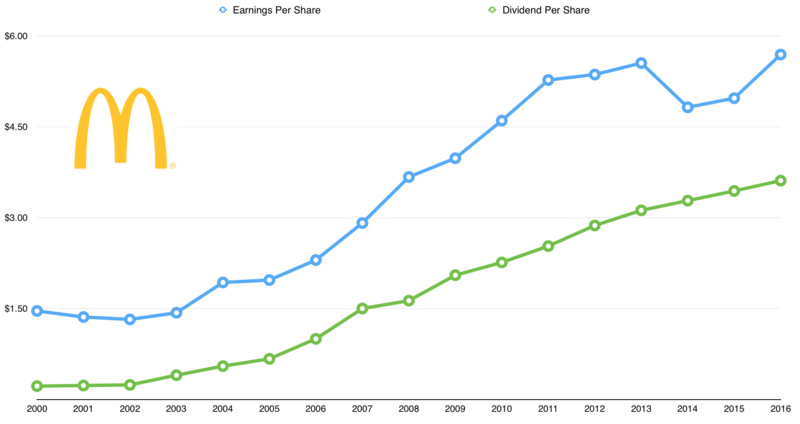 At the end of 1999 McDonald’s shares were changing hands for around 30x annual earnings. Let’s say you made a long-term commitment to holding McDonald’s at that point. This was going towards the kids college fund. Or a little nest egg that will contribute some income in retirement. Whatever it may be, you were going to hold it in the knowledge that given enough time McDonald’s stock was likely to prove to be a habitual compounder of your wealth. You put your buy order in at the end of 1999, which at the then share price of around $40 would’ve bagged you 250 shares on a $10,000 investment. As the years go by you check the annual reports and make a small note of earnings and the dividend checks deposited into your account. If you distill the numbers down to the basics you see annual earnings growth of 8.85% plus around $29.60 per share from all the dividends paid out in that time. Granted, at the start of the period those 250 shares were only throwing off $55 worth of dividend income; hardly worth getting out of bed for I hear you say. As of last year though you’d be in the solid position of seeing just over $900 pumped out on that initial $10,000 lump sum (that’s not including the effect of reinvesting dividends along the way either). The other great thing about that performance? A huge chunk came from the company using their huge cash flows to bring the share count down from 1.35 billion to around 850 million as of late 2016. It’s the literal definition of a compounding machine that can “self fund” its own growth. This is why I think it helps investors out to separate what’s going on with the business and what’s going on with the stock. That’s what helps you to ride out the kind of 70% declines that hit McDonald’s shareholders between 2000 and 2003. If your natural response to that was, “The underlying earnings are actually okay here, plus they give me a nice dividend increase each year”, then you’ll do very well with blue chip stocks in the long run. Okay so how about the big picture then? Well, all-in-all an investment in McDonald’s stock would have compounded your wealth at an average rate of 8.1% per annum to the present day. That gets bumped up to 9.4% assuming the dividends were reinvested along the way. But the price you ended up paying for that 30x earnings was that the returns didn’t match the underlying business performance. Don’t get me wrong, that doesn’t necessarily have to be a bad thing. After all those annual returns have crushed both the Dow Jones Industrial Average and the S&P 500. But potential contraction of the value multiple is just something that you need to factor in during the initial investment. Hopefully it now becomes clearer on where a comparison with Starbucks makes a little bit of sense. At the time of the original post Starbucks stock was trading at 30x last year’s earnings. Just like with McDonald’s you’ve got the same quality profits, and the great historical and future growth prospects to boot. You’re also probably going to have to factor in some value contraction when thinking about returns over the next decade or two, even though that needn’t end up being a bad thing if the business carries on doing great.